Venus passes close to Jupiter in the western evening sky during late June and early July in a dazzling celestial display. 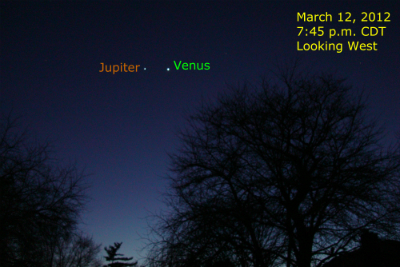 The image above shows the planets in 2012 when they passed within about 3 degrees of each other. During the 2015 conjunction, the planets appear 9 times closer. This article outlines the circumstances of conjunctions between Venus and Jupiter, the events of this conjunction, and concludes with a list of future Venus-Jupiter conjunctions. See this article for more as Venus as an Evening Star.